In a mixer, mix butter and sugar. Add one egg at a time to the mixer. Stir in cheese and corn. Combine flour, cornmeal, baking powder and salt. Add to other ingredients, stirring to fully mix. Pour into a 13x9 inch pan. Bake at 350 degrees for 30 minutes. Let cool. Cut cornbread horizontally to make thinner slices. Cut into wedges or circles. In a 350 degree oven, toast for 10-15 minutes. Let cool. Heat a large sauté pan over medium heat for a couple minutes. Add the butter. Once the butter has melted, add the onions, pepper and celery to the pan. Sauté the vegetables until they are tender, about 6-8 minutes. Stir in the bay leaf, tomatoes and garlic. Bring the mixture to a boil. Reduce heat and simmer for 15 minutes. Whisk the flour and water to incorporate in a small bowl. Stir into the vegetable mixture. Cook for 4-5 minutes to thicken the mixture. Add the clam stock, Worcestershire and hot sauce. Continue to simmer for 10 minutes. Dry the shrimp with paper towel or a clean cloth. Toss shrimp with Creole Seasoning. Add the shrimp to the mixture and cook another 6 to 7 minutes or until the shrimp are cooked through. Season with extra hot sauce, Creole seasoning, salt and pepper, if needed. 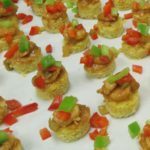 Place shrimp on cornbread toast, drizzle with some of the Creole Sauce and garnish with green and red bell pepper. CORNBREAD: This recipe may make more than you need for this appetizer. The cornbread, before it is toasted, will freeze nicely. SHRIMP CREOLE: This recipe will make 50 or more appetizers, which may be more than you need. Both the Cornbread and the Shrimp Creole can be frozen. The Shrimp Creole over rice with a side of cornbread is a fantastic dinner.